Click to download for Java. Requires Java 1.8 installed on Windows or macOS. 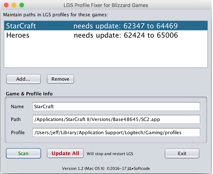 ﻿Have ﻿you ﻿noticed ﻿your ﻿LGS ﻿gaming ﻿profile ﻿not ﻿working ﻿each ﻿time ﻿Blizzard ﻿patches ﻿Heroes ﻿of ﻿the ﻿Storm ﻿or ﻿StarCraft ﻿II? ﻿That’s ﻿because ﻿behind ﻿the ﻿scenes, ﻿Blizzard ﻿moves ﻿the ﻿game ﻿application ﻿and ﻿LSG ﻿gets ﻿confused. ﻿LGS ﻿Blizzard ﻿Fix ﻿makes ﻿it ﻿1-click ﻿easy ﻿to ﻿keep ﻿your ﻿LGS ﻿profiles ﻿linked ﻿to ﻿the ﻿right ﻿game ﻿apps. ﻿Just ﻿locate ﻿each ﻿of ﻿the ﻿versioned ﻿game ﻿files ﻿once ﻿and ﻿then ﻿run ﻿this ﻿app ﻿whenever ﻿Blizzard ﻿patches ﻿their ﻿game ﻿to ﻿remap ﻿your ﻿LGS ﻿profile. ﻿If ﻿you ﻿have ﻿multiple ﻿LGS ﻿profiles ﻿for ﻿the ﻿same ﻿game, ﻿all ﻿profiles ﻿will ﻿be ﻿updated ﻿at ﻿once. Click to download for WoW. This is a stand-alone Add On. 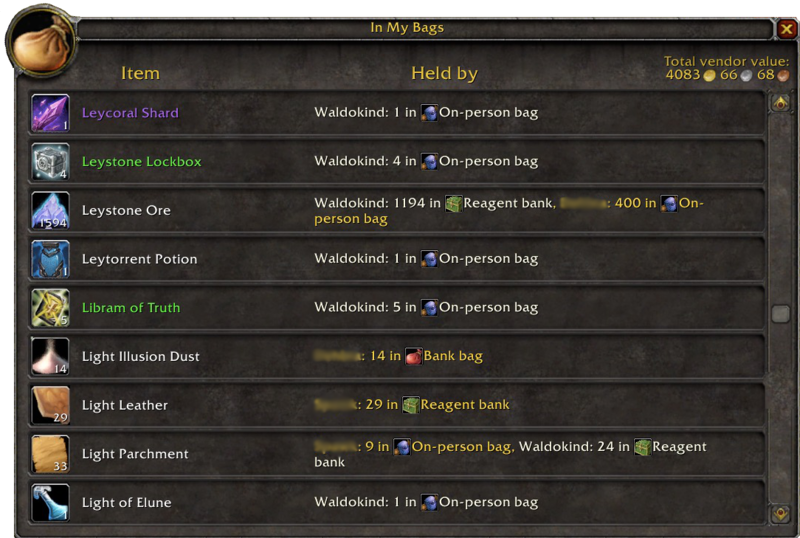 ﻿In ﻿My ﻿Bags ﻿gives ﻿you ﻿a ﻿searchable ﻿list ﻿of ﻿the ﻿bag ﻿and ﻿bank ﻿contents ﻿of ﻿all ﻿your ﻿WoW ﻿characters ﻿while ﻿logged ﻿into ﻿any ﻿one ﻿of ﻿them. ﻿It ﻿does ﻿not ﻿change ﻿your ﻿bag ﻿or ﻿bank ﻿interface. ﻿⁃ ﻿/imbscan: ﻿update ﻿the ﻿database ﻿with ﻿everything ﻿in ﻿your ﻿bags. ﻿Use ﻿at ﻿a ﻿bank ﻿teller ﻿to ﻿include ﻿everything ﻿in ﻿your ﻿main ﻿bank ﻿and ﻿reagent ﻿bank. ﻿Must ﻿do ﻿for ﻿each ﻿character. ﻿Database ﻿only ﻿updates ﻿when ﻿you ﻿type ﻿/imbscan. ﻿⁃ ﻿/imb: ﻿view ﻿an ﻿alphabetical ﻿list ﻿of ﻿items ﻿held ﻿by ﻿all ﻿of ﻿your ﻿characters, ﻿including ﻿quantity ﻿and ﻿bag ﻿location. ﻿⁃ ﻿/imb ﻿me ﻿or ﻿/imb ﻿name: ﻿filter ﻿the ﻿list ﻿to ﻿current ﻿or ﻿other ﻿character. ﻿⁃ ﻿/imb ﻿any ﻿text: ﻿filter ﻿the ﻿list ﻿to ﻿items ﻿containing ﻿that ﻿text. ﻿⁃ ﻿/imb ﻿[shift-click ﻿any ﻿item]: ﻿filters ﻿the ﻿list ﻿to ﻿show ﻿items ﻿containing ﻿that ﻿name. macOS X 10.8 or newer. 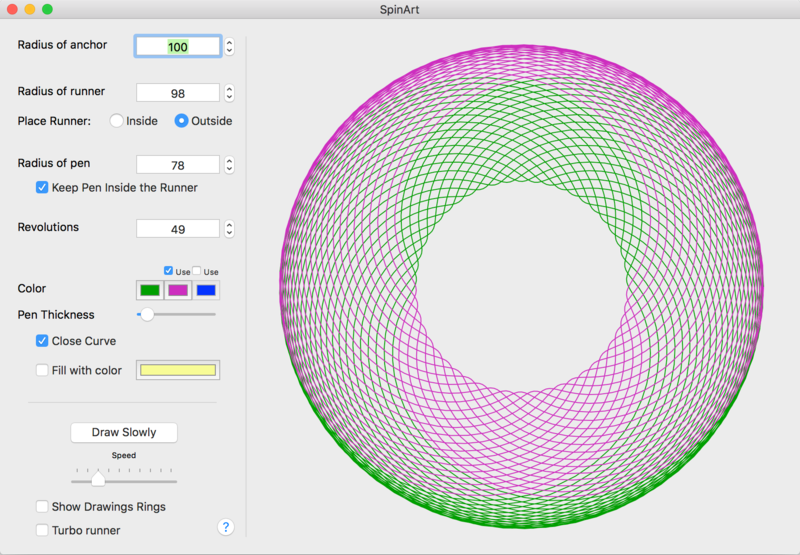 ﻿SpinArt ﻿draws ﻿graphics ﻿reminiscent ﻿of ﻿Hasbro’s ﻿mechanical ﻿art ﻿toy, ﻿the ﻿Spirograph™. ﻿It ﻿has ﻿many ﻿“knobs” ﻿to ﻿turn ﻿to ﻿get ﻿just ﻿the ﻿geometric ﻿creation ﻿you’re ﻿looking ﻿for. ﻿You ﻿can ﻿save ﻿your ﻿art ﻿as ﻿a ﻿hi-rez ﻿PNG ﻿file ﻿or ﻿as ﻿a ﻿vector ﻿PDF. 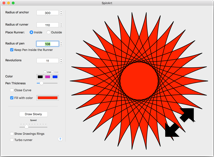 ﻿The ﻿vector ﻿PDF ﻿can ﻿be ﻿opened ﻿in ﻿an ﻿Illustrator™-type ﻿application ﻿such ﻿as ﻿Affinity ﻿Designer™ ﻿for ﻿use ﻿in ﻿other ﻿projects. 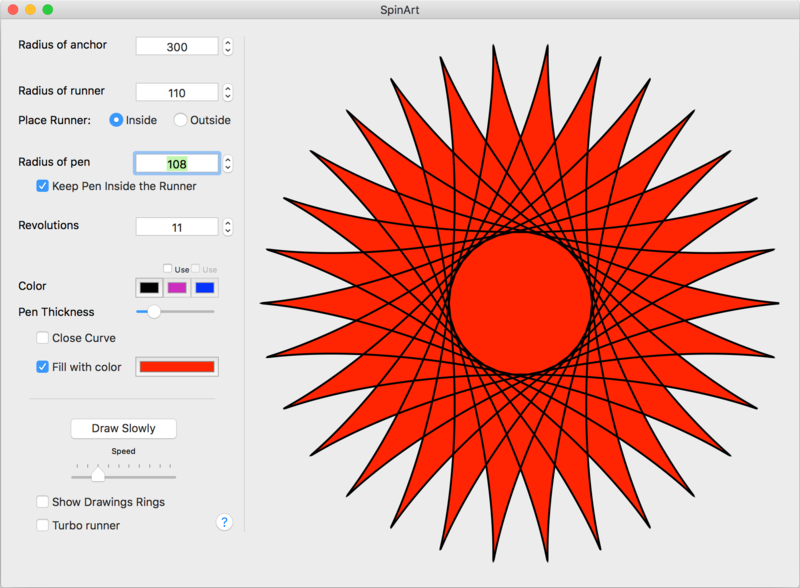 ﻿Zone ﻿out ﻿to ﻿“slow ﻿draw” ﻿mode ﻿with ﻿ring ﻿visibility ﻿watching ﻿the ﻿pen ﻿loop ﻿around ﻿just ﻿like ﻿sitting ﻿at ﻿the ﻿table ﻿with ﻿your ﻿old ﻿Spirograph™ ﻿set.